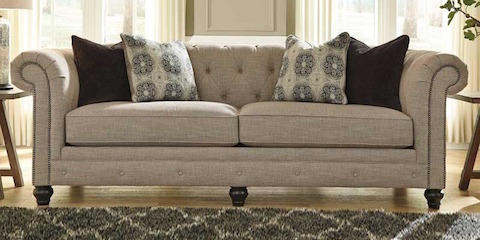 You'll save money by purchasing living room furniture at a store with low overhead. Serving Indianapolis,St. Louis, MO, and the surrounding areas, Weekends Only Furniture & Mattress is open just three days a week, Friday through Sunday, and this limited schedule allows these experts to keep their costs low. They pass these savings on to you, so you can enjoy rock-bottom prices on everything you need to optimize your home decor. The shopping experience is easy and relaxed. The salespeople at Weekends Only Furniture & Mattress aren't paid on commission, and this means they'll honestly answer your questions instead of trying to force you into a sale. You'll find living room furniture, bedroom furniture, and more displayed in spacious 40,000- to 50,000-foot showrooms designed to make browsing a breeze. Most of the furniture offered is available to go home with you on the day of purchase, so you won't have to deal with the frustrating four- to eight-week waits that are part of the process when you’re shopping at most furniture stores. Weekends Only Furniture & Mattress first opened its doors in 1997. Its founders, Tom and Dave Phillips, were raised in a family that's been in the furniture business since 1937. The company has five stores in the St. Louis area and recently expanded with a new store in Castleton, IN. Low prices on the finest living room furniture and home decor have led this store to experience steady sales growth, and the company is included in Furniture Today's list of the top 100 US furniture stores. New deliveries arrive every week, so whether you're looking for living room furniture or a mattress for your guest bedroom, you're sure to find just what you need. Give your home decor a boost by calling Weekends Only Furniture & Mattress at (855) 803-5888, or visit these furniture professionals online to view their wide range of exceptional products.